I first tried pasta carbonara at a Maggianos restaurant earlier this year and just couldn't believe how great it tasted (also didn't consider the calories it might have). Since then I've been peeking around for recipes that could help me replicate what I had that night. Honestly the ingredients never seemed super crazy for this dish, but there were some weird techniques when making the sauce that made me nervous to try it. 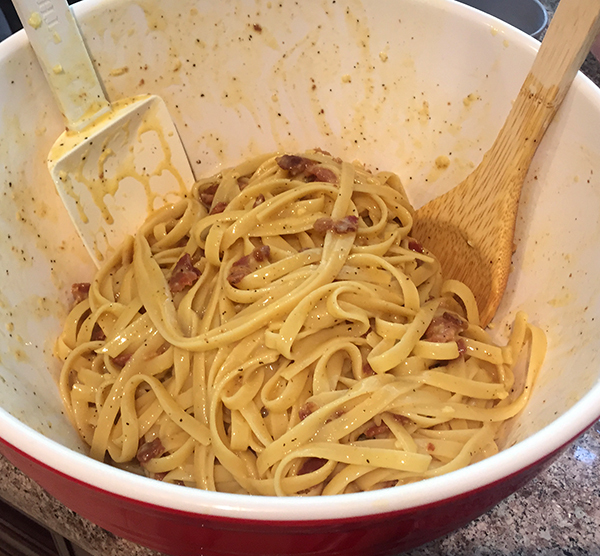 Cooking Classy's recipe for Pasta Carbonara is no exception! The ingredients are easy, but prep gets pretty busy halfway through. 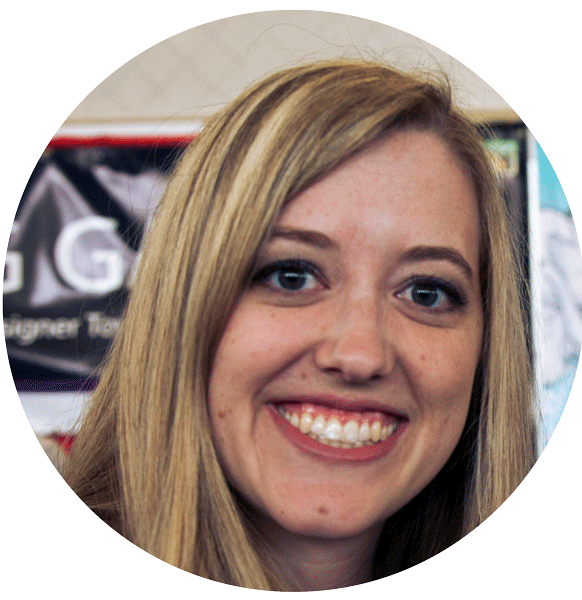 It felt a little like I was back at work juggling multiple projects. So! For this recipe I asked Mama Tate for help just to make sure I didn't irrevocably mess anything up and ruin dinner for the night. The sauce requires a few things being done at the same time so I tried my best to order this in a way that ensures everything is brought together at once. Sounds exciting, right? Here we go! 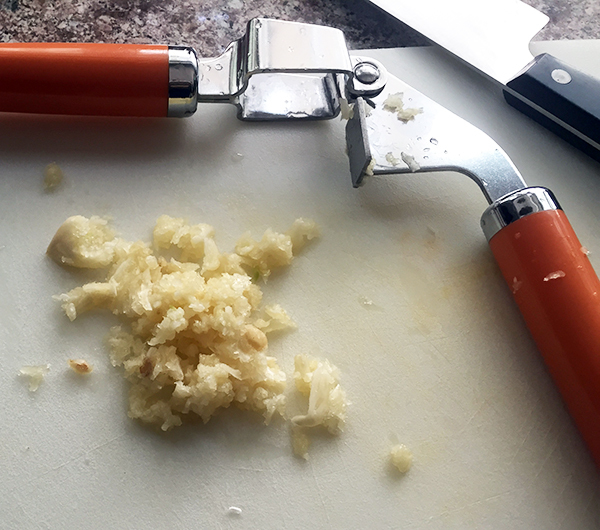 Start off mincing the ginger. Ho-ho! 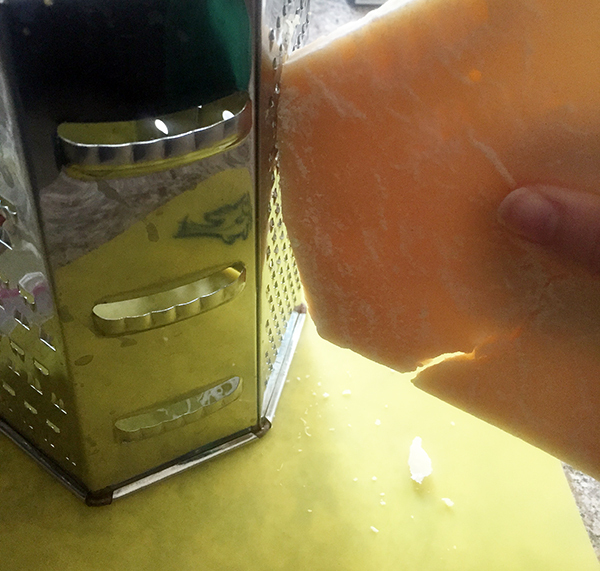 Look at this parmesan cheese block! Finely grate 1 1/4 cups of parmesan cheese for later use. 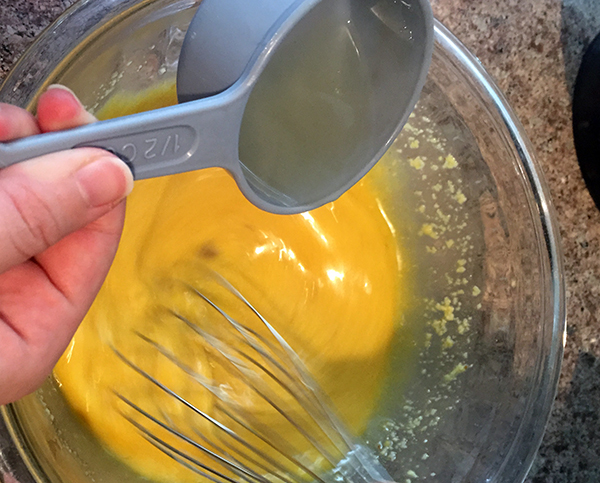 Put 3 large eggs and 1 egg yolk into a bowl. Set aside for now. You can see the extra egg white leftover from the 4th egg where we only needed the yolk above. Cut the bacon into 1/2 in pieces. For easier cutting I stuck the bacon in the freezer for 10 mins. 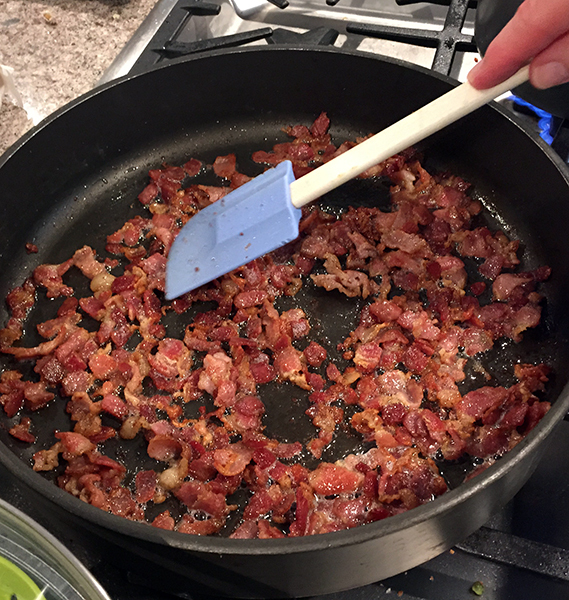 Add 1/2 cup of water and bacon to a large skillet and turn the heat to medium-high. Cook until water evaporates. I used extra thick bacon so it took 10-11 mins. Once the water has evaporated, reduce heat to medium-low and cook until the bacon is brown and crispy. This was another 15 mins since we had thick bacon, but it it could be closer to 6-8 if you're using regular bacon. Get a bowl and strainer prepped for once the bacon is done. 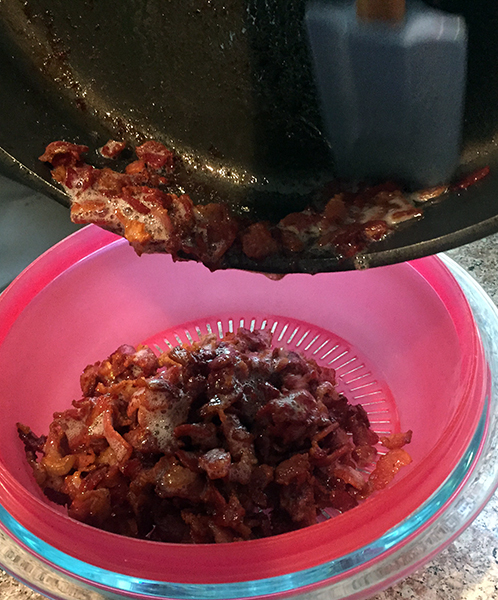 Pour the bacon over the strainer and save 1 teaspoon of the rendered fat. Get a large pot ready for the spaghetti. Place 8 cups of water inside and boil. 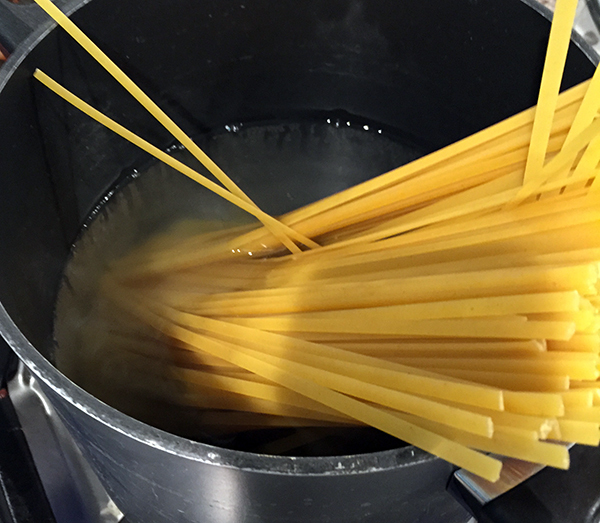 Once boiling, add salt and spaghetti and cook until al dente. I followed the spaghetti box instructions for al dente timing. While the pasta's cooking let's get the sauce prepped! 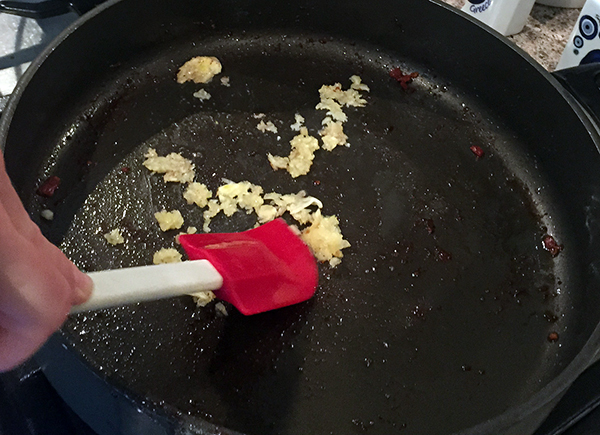 Using the same pan as the bacon, turn the heat back to medium and then saute the minced garlic. This garlic can burn soooo easily so keep it moving and take it off once it's lightly golden and fragrant. This took less than a minute for me. 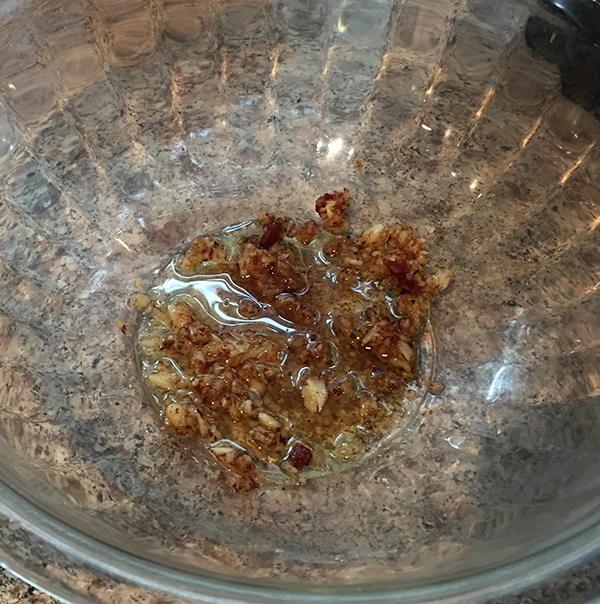 Mix the garlic and the rendered bacon fat together in a mixing bowl. Add the parmesan, egg yolks and pepper to the bowl and whisk until well combined. 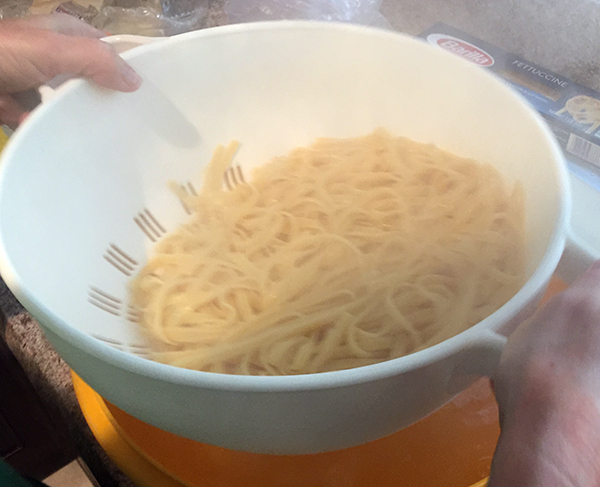 When the spaghetti is done get another bowl and strainer to collect the starchy pasta water. Collect 1 cup of the pasta water to mix into the sauce (half to mix into the sauce, and the other half to thin the sauce as needed.) Pour the pasta into its own large bowl for mixing shortly. The hot pasta water can cause the eggs in the sauce to scramble so get the sauce mixing and then slowly add in 1/2 cup of water. With all the components ready we can do the final mix to make our pasta carbonara! Slowly pour in the sauce while constantly tossing the pasta to coat. Now add in the bacon. If you want to season with additional salt or pepper you're free! Otherwise, let the pasta sit for a few minutes so the sauce can soak in and thicken. You can also thin the sauce with the other 1/2 cup of hot pasta water. Remember to reheat if it's no longer hot. After that, you're all ready to serve! I cooked up some asparagus to try and add a bitter element to an otherwise very rich dish. I enjoyed the taste combo! I think this would definitely be easier on the second run-through, but boy did things get hectic on this first try over here. 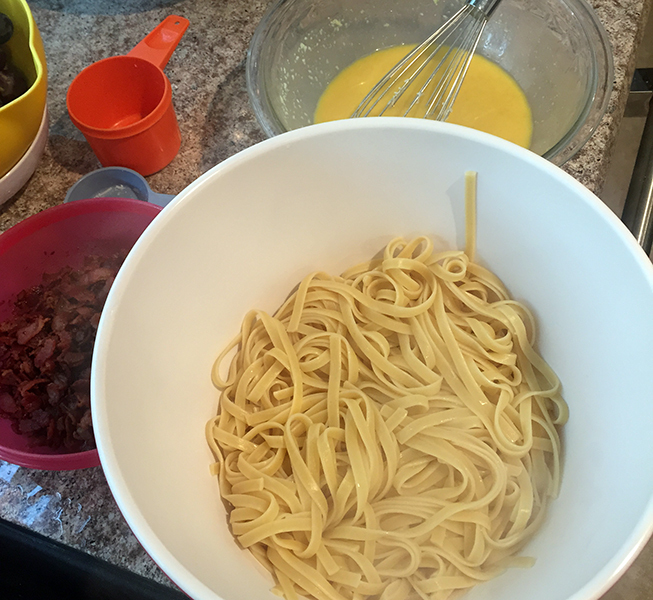 I struggled with ensuring the pasta finished on time so we had scalding hot pasta water and also getting the garlic and sauce prepped and making sure we had the bacon fat ready. Let me know if you give this a go and how the dish management went!